Our New Kiwi Box Website is Live! Home » Our New Kiwi Box Website is Live! We are thrilled to announce the launch of our new-look website! 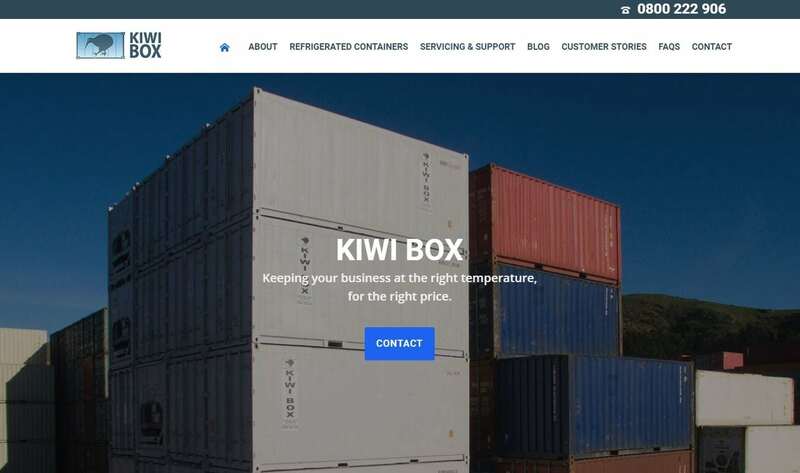 Our new website helps us deliver on our promise of delivering the country’s best refrigerated shipping container rental and sales service and products to our valued customers. With our vast experience as qualified refrigeration engineers, we at Kiwi Box pride ourselves on customising the right storage container to suit your unique needs. We also offer regular servicing and support of our leased containers and on an annual basis we travel the South Island to service each and every one. With our 24/7 breakdown service our customers can feel safe in the knowledge that, should the worse happen, we’ll be there asap to remedy the problem. Our new locations page gives information and contact details for each of our nine locations throughout the South Island including Christchurch, Nelson, Timaru, Blenheim, Greymouth, Cromwell, Alexandra, Dunedin and Invercargill. And to top it all off, just about every question you can imagine has been answered in our new FAQs section plus our blog is a rich resource of articles dedicated to the refrigerated storage industry. We hope you love our new website as much as we do. We’d love to help you out with your next project — so take a look around the site then drop us a line or give us a call on 0800 222 906 any time!